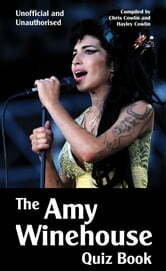 Saturday 23 July 2011 will be etched on the memories of music fans both in the UK and the world over as the day the music industry lost a hugely talented female singer who still had so much to give, but her legacy will live on forever. Amy Winehouse’s first album, which she released in 2003 at the age of 19, showcased her distinctive soulful style and received critical acclaim as well as multi-platinum status, and this was followed by an even more successful album as well as solo singles and collaborations, ensuring her place among the world’s greatest female artists. By the end of her short career and troubled life, Amy had sold 1,753,418 singles and 3,982,571 albums in the UK alone and had been the recipient of 23 music accolades, including Grammy, Ivor Novello, MOBO, BRIT and Mercury awards. This quiz book is a tribute to Amy’s talent and to a life and career cut short so tragically and will ensure that her memory is treasured in the hearts and minds of all music fans.